Heat 1,5 litres of water, one bottle of cider, cinnamon and star anise, the remaining spices and 30ml salt together in a saucepan. Once the liquid has come to a boil and the salt has dissolved, remove from the heat and set aside to cool completely. Put the chicken into a large resealable bag and pour in the liquid. Seal closed. Alternatively use a plastic container with a lid, just big enough for the chicken to fit into. The brine should cover the chicken. Refrigerate overnight. Turn the bag over once or twice. Remove the chicken from the brine and drain completely. Discard the brine. Pat the chicken dry with kitchen paper. Put the onion halves and garlic into the chicken cavity, then tie the legs together with string. Put the chicken onto a rack in a roasting pan. Pour the remaining cider into the pan and add the remaining vegetables to the pan under the chicken. Roast in a preheated oven for 20 minutes. Remove from the oven. Spoon some of the liquid over the chicken. 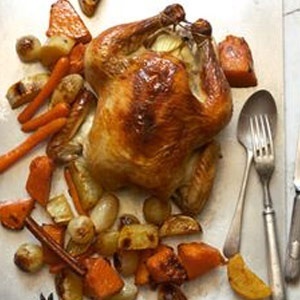 Decrease the heat to 160°C and continue to roast for a further 40 to 50 minutes until the chicken is cooked through. Set the chicken aside for 15 minutes before carving.